I have spent a lot of time wondering whether or not this story is true. Could it just be a figment of my Malarone-altered dreams, or do I really have a roommate? 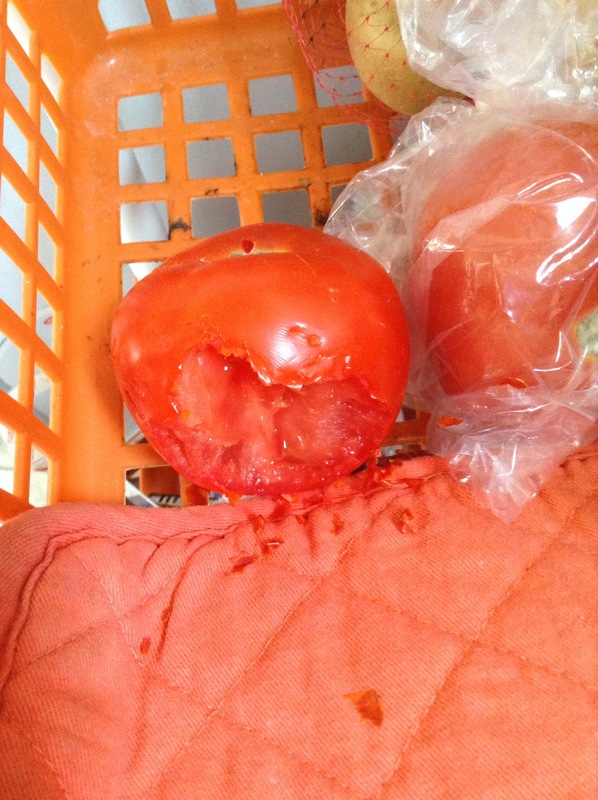 In the week that this has occurred, my course of Malarone (malaria prophylaxis) has ended, and there are definitely rodent feces, and a tomato has definitely been consumed by something. And all those noises I hear once it gets quiet in my hut just before bedtime and after turning off the light, I have decided that they are not a figment of my addled imagination but real. I have a furry roommate. This story may have started while I was away for Thanksgiving, but I can only confirm that I started hearing strange noises on Saturday all throughout the day. It sounded like something was behind my kitchen counter. I moved some things around but found no evidence. Then, while two of my kids were over watching a movie, I shifted a few more things and out ran a small, furry creature. I don’t know the difference between a mouse and a rat, so hence the rodent from the title of this post. We all saw it and immediately went on the defensive. It took about an hour that involved emptying about half of my room into the front yard to catch the furry thing. We never really caught it though, because it ran out my door of its own accord. We returned my belongings to my house without putting them away, deciding we should clean my house the following day. I hardly slept that night, though, because I continued to hear noises all night, including my dirty dishes moving around in my washbasin. My kids and I thoroughly cleaned my room on Sunday, but there were noises again that night. On Monday night my bhuti found a suspected black mamba right outside my door, and I asked for it to live, so that it could eat my furry roommate. 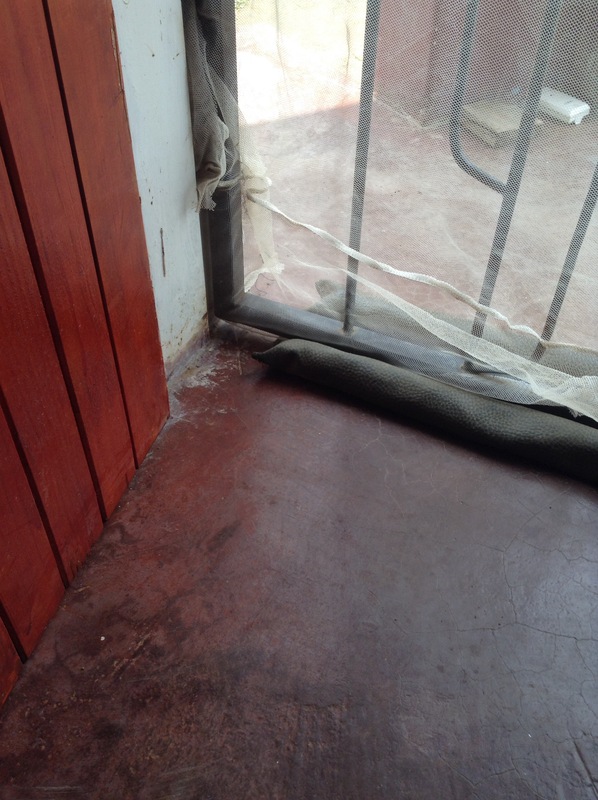 My wish was not granted as make beat it to smithereens right away (yes, this is normal snake treatment in Swaziland). I asked my tutor what I should do, and she suggested a rat poison that is available at the local shop. On Thursday I decided to purchase this after moving my kitchen counter away from the wall in attempts to scare away my roommate. I could not find it, but there were plenty of feces. It does not seem to be eating any of my packaged food, but only food that is uncovered and accessible. The food I have stashed on top of my water filter has not been touched, but the tomato on the top shelf of my veggie rack has been eaten two days in a row. What I have decided is that my roommate has been coming and going during the nighttime hours. I have spent every day of the last week in my room, and since Saturday, there have been no daytime noises. I have found no holes in my wall, which leads me to believe the creature is coming through my door unannounced. I have spent most of my time in my room at my desk, which is immediately next to my door, or sitting on the floor or my bed with a view of the door, which means the creature is stealthy, until it is makes it way behind my counter and starts making noise. This whole situation has put me on edge, where I look up at every little noise and wonder if it is the creature. I have been sleeping with earplugs in an attempt to reduce the noise it makes once I have turned the light off and climbed into bed. 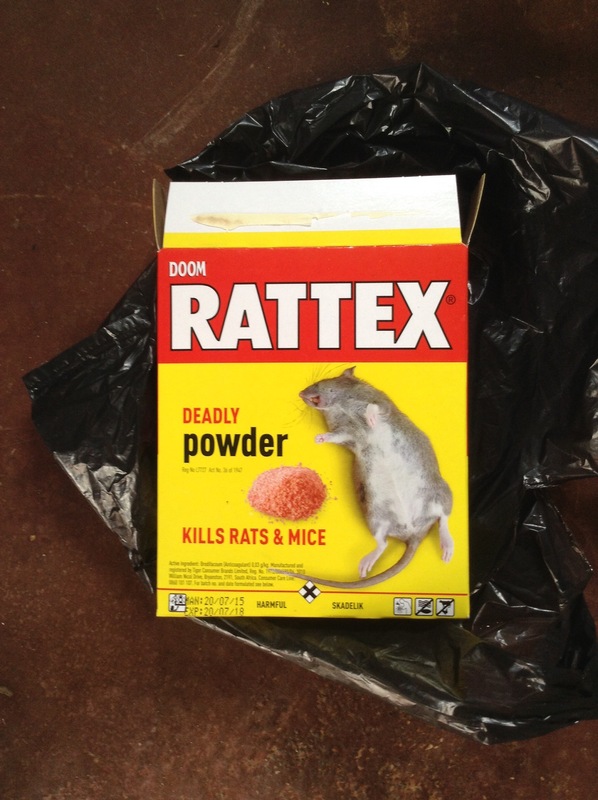 I have taken so long to choose the poison because I am concerned the rodent will die in a place that is not visible and I will only find it once my room smells like dead rodent. But I cannot keep living like this, so the poison seems like the best option. The title of this post comes from the book by Mark Haddon, which I read several years ago and have remembered nothing but the interesting title. Intriguingly enough, this title comes from a Sherlock Holmes mystery, and one of the things I have occupied myself with during this curious incident is binge-watching the first three seasons of Sherlock. You should watch it, but maybe not while paranoid about a rodent living in your house. July 2018 update: A dead rodent was found under my fridge on move-out day. Whether or not this is the original rodent is unable to be determined. This entry was posted in Africa, Life, Peace Corps, Swaziland and tagged Africa, PCV, Peace Corps, peace corps swaziland, Peace Corps Volunteer, Swaziland. Bookmark the permalink.